Creation of the world is one of the most important events in the history of human kind, but not without the colors of mythology to add a distinct flavor to the world as experienced. True to these words, Hinduism has its idea to share which attributes the process to the God of Creation - Lord Brahma, one of the Three Lords, other being Lord Vishnu (God of Manifestation) and Lord Shiva (God of Destruction). Pushkar is one of the few places on the earth with the temple dedicated to Lord Brahma and hence is considered of prime importance, thus referred to as 'Tirth Raj' with more than 500 temples in this small town. A town in renowned district of Ajmer of Rajasthan, Pushkar is known for few other religious and tourism aspects. Also, the place is supposed to have been among the oldest, while the temples standing here are not very old but built only few centuries ago, reason being the invasion of Muslim rulers. The holy lake of Pushkar holds much religious significance, due to which pilgrims do not leave the place without taking a holy dip in its revered waters. The annual Pushkar Camel Fair is well-known for its popularity among the tourists, especially foreigners who get a glimpse in the ways village folks make their lives versicolor. As with most of the old towns housing paramount Hindu shrines, age of Pushkar could not be estimated exactly but the legends and myths tell about its antiquity. One of such stories narrates Lord Brahma searching an ideal place to perform a Yagya and found it in Pushkar. However, before securing the place for the ritual, he had to kill a demon Vajranabha raving in the area. After that, he performed the ritual but when he was to sit with his consort Goddess Saraswati, she couldn't be found. For the timely completion of the ritual, he wedded Gayatri - a Gujjar girl of the town, which ensued the anger of the first wife and she cursed Lord Brahma to be revered only in Pushkar. Till date, the priests of the temple are Gurjars / Gujjars only, referred as 'Bhopas'. 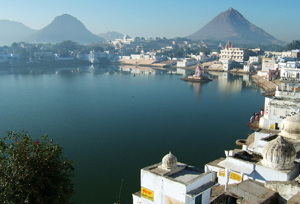 The Pushkar Lake is supposed to have got created with a petal of Lotus with which the demon was killed. The place also finds mentions in Vamana Purana and Mahabharata in relation with Prahalad and Yudhisthira, respectively. 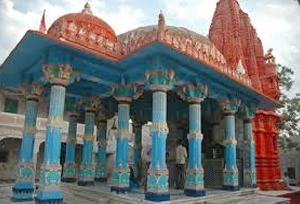 Shri Brahma Temple: The temple located near the Pushkar Lake, is most revered temples located in the town and holiest of all the Brahma Temple around the world. A huge idol of the creator of the universe inspired worship in mere mortals easily. Pushkar Lake: The Lake originating from Luni River, has 52 bathing banks to facilitate huge crowds during the occasion of 'Kartik Poornima' in the month of October-November, all of them being dotted with numerous temples dedicated to various Gods and Goddesses in Hindu religion. Sacred to Hindu as well as Sikh rulers, this lake has its mention in history since 4th century. Varaha Temple: Being upset on huge idol of Lord Varaha (head of a boar and body of a man), the original temple of 12th century was destroyed by Mughal Emperor Aurangzeb. It was then rebuilt in 18th century by Raja Sawai Man Singh II. 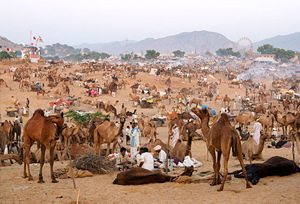 Pushkar Camel Fair: The festival is 'apple of eyes' of Rajasthan Tourism Department when it comes to the contribution of Pushkar to tourism. Held during the time of Kartik Poornima, the festival is also recorded as the 'World's Largest Cattle Fair'. The northern states get engage in huge cattle trade, while the locals and wandering tribes take the opportunity to paint the festival with excitement of rituals and games, which consequently interests foreign tourists. By Air: Sanganer Airport in Jaipur serves as the nearest airport to reach Pushkar, which is only 146 Km away. By Train: Pushkar is connected to the major cities like Mumbai, New Delhi, Indore, Kanpur, Hyderabad, Chennai, etc, via Ajmer. By Road: Jaipur and Ajmer connects Pushkar with the other cities and town via road. Regular bus services from Ajmer serve tourists and pilgrims to the town.